Dr Ronx is an Emergency medicine doctor by profession. She self-funded her way through Medical School after leaving home in her teenage years. During this time she worked part time in retail, fashion modelled and danced in music videos to sustain her progression through medical school. She graduated from Kings College Medical School in 2011. Her desire to train as an A&E doctor began after foundation training and took a year out before speciality training to work as an Expedition Field Medic in India. On returning to the UK, she began her A&E career and didn’t look back. Dr Ronx lives and works in Hackney and is extremely community-focussed. She volunteers her time to give inspirational talks using her life experience to encourage and inspire young people to think about their desired future careers positively. Her motto is “ You cannot be, what you do not see”. Dr Ronx believes this so much that she has even crossed the river to give talks in schools in South London. Dr Ronx also is involved in charity work. Last year she raised over £10000 for a refugee camp where undocumented Syrian refugees had settled in Turkey, she also volunteered there and was inspired to do more. 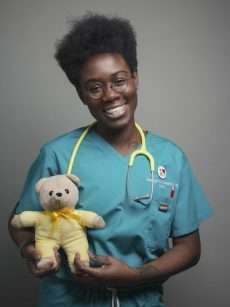 This year she hopes to join the charity “Street Doctors” as a Medic Expert Trustee who work alongside hospitals supporting victims of violent crime. As an A&E doctor Dr Ronx has dealt with many stab victims and witnessed the medical and emotional impact of knife crime. She is looking forward to having an official role in a charity that is close to her heart. Dr Ronx is also a panel member of the organisation “The Womb Room” which aims to provide a safe space for women with reproductive problems to share information and learn how to manage their conditions. As a queer person Dr Ronx hopes to ensure that the charity continues to remain inclusive and accessible to all people. In addition to this, Dr Ronx sits on a panel of Hackney Judges who meet yearly to award three nominated members of the Hackney community with the “Mayors Hackney Community Award”. And this year she has been nominated herself for the “Celebrating Hackney Women Award 2018”. In her spare time Dr Ronx is an avid runner and cyclist. She is a member of the London and Blenheim Triathlon medical teams and last year was the roving motto medic. Ronx has run the Hackney half marathon two years in a row now with her PB being 1hr 47minutes. This year she aims to run for the charity Street Doctors. Dr Ronx is passionate about everything that she does, her unique style, expert knowledge and engaging manner makes her one of Independent’s exciting new talents of 2018.